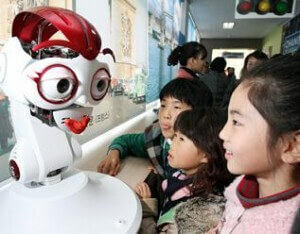 Robot teachers in Korea are set to join 500 classrooms by 2011, and 8000 classrooms by 2013. Did you ever have a teacher you could have sworn was a robot? Well yours wasn’t, but your child’s might be. The Korean Institute of Science and Technology (KIST) and the Nippon Institute of Technology (NIT) have fielded robotic teachers in Korea and Japan, respectively. 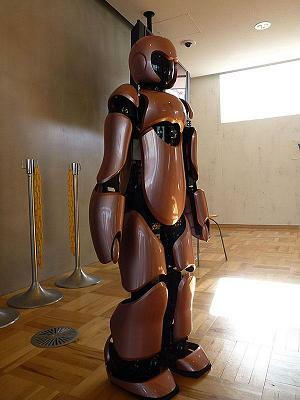 According to ETNews, robot teachers have passed the first round of testing and will expand into 500 preschools by 2011. Eventually these robots will be seen in 8000 preschool and kindergarten classrooms by 2013 with 50 billion KRW (~$44 million USD) in funding. The Korean robot teachers sing songs to young children, but the Japanese robots are geared to an older audience. NIT’s e-Nuvo humanoid robot comes with a built in projector, and is meant to build interest in science, technology, engineering, and math by discussing robotics. While each of these robots are far behind the capabilities of a human instructor, they showcase the potential for advanced automation in education. Give these guys some time, and you could see robot teachers become a staple of the classroom. Check out some great videos of e-Nuvo courtesy of RobotWatch and Diagonal View after the break. e-Nuvo is actually a joint project by NIT, ZMP, and others. It’s derived from a “walker” style robot which was created by ZMP in the last few years as a training tool for programming and robotics. I find the inclusion of a projector to be a very smart decision. If the bot is there to promote interest in science and technology, including multi-media is definitely the way to go. I've had few teachers that looked as cool as the e-Nuvo. And none had projectors built into them. Robot teachers are really just a natural continuation of many other automated education materials we’ve been developing for decades. Online videos can coach you in defensive driving, Rosetta Stone will teach you almost any language without ever having to meet another human, and I’m constantly learning new writing tips from Clippy. The real innovation in the KIST and NIT machines is the step they take towards giving students a presence they can meaningfully interact with. True, what these bots do is preprogrammed. Eventually, however, the physical presence of the robot will be augmented with the dynamic verbal responses that are being developed by chatbots and similar software endeavors. Once we have a machine that can improvise as it instructs, we’ll have most of the essential ingredients for automated teachers in a classroom. And I think the benefits of having a multimedia enabled, telepresence capable, and captivating device in the classroom will make us want them there. Probably as aides, but maybe as full authority figures. Who knows, high schoolers might show some respect to their teachers when they have steel pincers that can crush them. …Nah, probably not even then.